Only 41 overs of play were possible on the second day at Pallekele, before rain intervened once again to bring a premature end to play. A charged up Sri Lanka made two quick breakthroughs after lunch to even things up after Brendan Nash and Shivnarine Chanderpaul capitalised on a flat Sri Lankan bowling effort and a comical missed run out opportunity in the morning session. Sri Lanka's resurgence in the nine overs after the break had West Indies at 245 for 5 by the time the heavens opened up. A maiden century beckoned yet again for Darren Bravo as he began the second morning with the same nonchalant aplomb he had displayed for much of the previous day. Dilhara Fernando overpitched in the second over and Darren eased it casually past cover for four, seeming to have lost none of the form or fluency from his overnight 63. But he was out soon after crossing 50 for the third time in four innings this series. Fernando bent one in, off a full length, to rap Darren on the pads and despite the hasty review, Bravo was dismissed for 68. 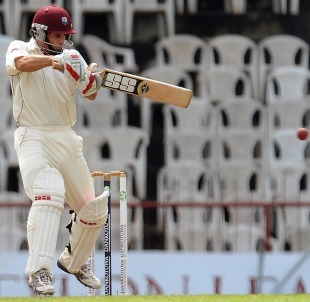 While Shivnarine Chanderpaul was circumspect in the early exchanges, Brendan Nash didn't take long to come to grips with the pitch, leaning back to slap Fernando behind point to get off the mark before racking up 1000 Test runs with a clip to the leg side after two more boundaries. The runs kept coming at a decent pace for Nash, as he picked the gaps and dispatched loose deliveries, while Kumar Sangakkara strove for wickets with attacking fields. Nash brought up his eighth Test half-century before lunch and was unbeaten on 62 when the weather intervened. Chanderpaul eventually found his feet against the spinners, rotating the strike efficiently towards the end of the session and leaving the boundary-hitting to his more fluent partner. He was given lbw by the on-field umpire when he missed a reverse-sweep off Herath on 38, but the review showed the ball to be brushing the glove before it hit the fore-arm guard, and the decision was overturned in his favour. Chanderpaul progressed to his first half-century of the series with a bottom-edged sweep off Herath, but was caught spectacularly at slip soon after. He attempted a late dab off Ajantha Mendis, but Mahela Jayawardene was onto it in a flash. Jayawardene dove to his left and plucked the ball one-handed, centimetres from the turf, ending the stand on 99. Dwayne Bravo fell in the following over to Herath, who made an immediate impact after being kept out of the attack for 58 overs. He had beaten Dwayne's edge two balls prior, but sucked him in completely with a flighted delivery that dipped and turned. Bravo barely had time to register that he had over-balanced before Prasanna Jayawardene had the bails off. Suranga Lakmal was consistent in his morning spell, but was rarely threatening. He never strayed far from the channel outside off stump, yet was unable to extract enough movement to worry the batsmen. Angelo Mathews, too, was negotiated without fuss by Nash and Chanderpaul, and Fernando was wayward despite Darren's wicket. The double-strike after lunch had the game finely balanced and the teams will be hoping for better weather over the remainder of the match if there is to be any hope of a result.